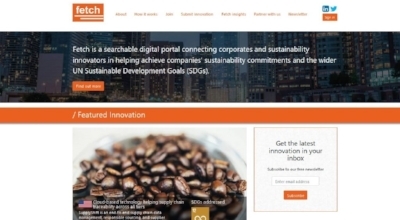 Dutch-based digital platform, fetch, believes “innovation is the key driver to building a sustainable future and an agent to fulfilling the SDGs.” The platform matches companies with sustainability and social-driven startups using a unique match-making portal which showcases market-ready startup innovations. Businesses can access a multitude of solutions on fetch – each categorized by industry or SDG – and pick the right solutions that align with their corporate sustainability goals. Alison Azaria, founder of fetch, explains the need behind the platform saying, “Through my experience in working with corporates and feedback from startups, I saw a gap and a channel missing in connecting the two together.” With more than 200 innovations currently featured on the platform, fetch aims to become the “world’s largest digital platform with a searchable database organized by SDGs.” New startups can contribute to the platform by submitting on the website, and both companies and startups can join for free. Many of today’s most pressing social and environmental issues are too complex to solve alone – and the philosophy of the SDGs recognizes this. Indeed, in the preamble to the SDGs, the document states: “All countries and all stakeholders, acting in collaborative partnership, will implement this plan.” That is why collaboration is such a key component to achieving the SDGs. Partnering with startups is one way to advance the SDGs while at the same time sharing knowledge, expertise, technology and financial support to bring innovative solutions to market for others to model and learn from. As more companies commit to the SDGs, we look forward to seeing more unique partnerships form for the goal of a more sustainable, collaborative future.